UPDATE: MTS is now down because of this issue. Good news – it will be fixed during tomorrow’s 6-hour maintenance. However, you might still get hacked. Click here to see a list of people whose information is in hackers’ hands. Please note that this list is ONLY character names, so search for your character’s name (use CTRL + F). The original list also had Nexon ID’s but it will not be posted. Credits to Penitent of BasilMarket for the list. As some of you may be aware there is an exploit with the MTS that allows certain abusers to find your user ID. While we work on addressing this exploit please know that the MTS is safe to use and will not compromise your account as long as you have kept your password up to date with a secure PIC. We greatly apologize for the inconveniences this has caused for our players. Thank you. Seems ridiculous, I know. Not too long ago I warned you about MapleStory Adventures, and now it’s MTS. However, this is much more serious. With MapleStory Adventures, I had no solid proof at all nor did Nexon say anything. Here, Nexon IS our proof. Apparently, selling an item in MTS exposes your ID and password and hackers can get it. There have been reports of people being hacked because of this issue, however nobody trusted them till now. The matter is serious. If you have anything in MTS, TAKE IT NOW. Don’t buy anything till it’s fixed. KMST v.1.2.401 ~ Monster Carnival Revamp! Another revamp?! Just yesterday, I told you about the Mu Lung Dojo revamp (might actually want to read that again, I made a LOT of changes), and today there’s another one to another PQ, Monster Carnival. KMST v.1.2.400 ~ Dojo Revamp! I’m finally back home and what do you know? A new patch! It’s finally something interesting, Dojo revamp! Anyway, let’s start talking about what changed! 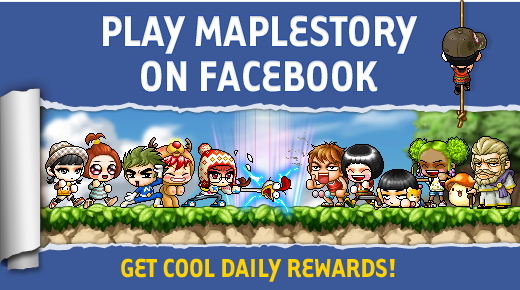 The MapleStory Facebook app MapleStory Adventures had its Closed Beta, well, closed and it’s finally out! DON’T GET EXCITED YET. I know there’s an event that if you reach level 5 on MapleStory Adventures, you’ll get EXP and Mesos. However, it’s really dangerous to do so! Over the past few days there was another patch in KMST that strengthened the new boss discussed in the previous blog post, Akyrum. Its damage is 3 times as strong! There was another patch now but this time it was KMS! Hopefully I’ll be able to get the WZ for KMS and expand this post. If not, I’ll be back home in about a week or a little more anyway. So anyway, the patch brought all the things we discussed. Apparently, it’s the 4th part of the Legend update. Since I’m WZ-less, most of the info will come from the official website and from Fiel of Southperry. KMST v.1.2.398 ~ New ToT Areas, GMS Exclusive Content, and more! Still got no WZ… Tried installing KMST today but this computer doesn’t have enough space for it -_-“. Still, if anyone can please upload Map.wz/Mob.wz/String.wz it’ll be very helpful! I’ll refer you to Fiel’s extraction if you want details till I get the WZ files I need. For now, I’ll translate the patch notes for you. All updated with skill builds! Yep that’s all for blog updates, now for news. I’ll start out by saying that I’m on vacation. I’ll be back a couple of days before the month ends. Yeah, all you other MapleStory bloggers may celebrate. KMS v.1.2.138 ~ Demon Slayer & GMST v.07 ~ GMS Exclusive Content! UPDATE: GMST stuff is up! It’s finally August 4th and even before the patch there was already a surprise, two trailers! They’re identical except that one shows a male version of Demon Slayer and the other is a female one. The patch was very large, 169.89 MB (Download the PATCH file here)! Anyway, I already talked about most of the stuff in KMS so that will be no problem! Another patch today! I got my Demon Slayer to 107 before this patch and just noticed there was a patch. Before I get into the storyline, I’ll talk about the item potential changes. Mesos & Item Drop Rate increase (20%)! 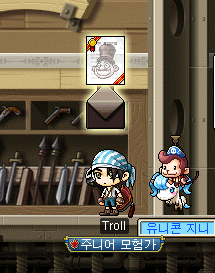 Leafre - Korean MapleStory English-speaking community. BasilMarket - Global MapleStory website. Hidden-Street - Global MapleStory Database. 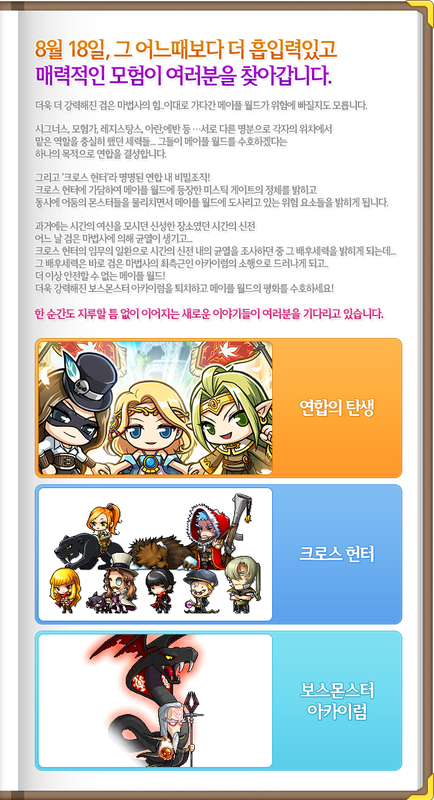 Insoya - Korean MapleStory website. Maple Inven - Korean MapleStory Database. Maple Times - GMS blog. MS Update - News of every Nexon updates. Maple News - News of MapleStory ONLY.